Galatians 5 [15.] But if you bite and devour one another, be careful that you don’t consume one another. But I say, walk by the Spirit, and you won’t fulfill the lust of the flesh. For the flesh lusts against the Spirit, and the Spirit against the flesh; and these are contrary to one another, that you may not do the things that you desire. But if you are led by the Spirit, you are not under the law. Now the deeds of the flesh are obvious, which are: adultery, sexual immorality, uncleanness, lustfulness, idolatry, sorcery, hatred, strife, jealousies, outbursts of anger, rivalries, divisions, heresies, envy, murders, drunkenness, orgies, and things like these; of which I forewarn you, even as I also forewarned you, that those who practice such things will not inherit God’s Kingdom. 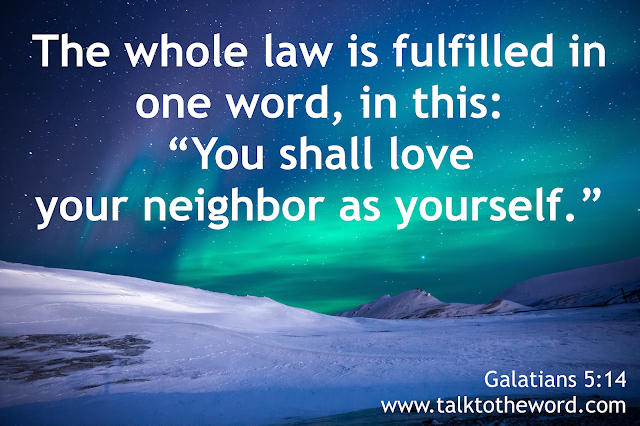 Galatians 5 [22.] But the fruit of the Spirit is love, joy, peace, patience, kindness, goodness, faith,[b] gentleness, and self-control. Against such things there is no law. Those who belong to Christ have crucified the flesh with its passions and lusts. If we live by the Spirit, let’s also walk by the Spirit. Let’s not become conceited, provoking one another, and envying one another. a. Galatians 5:14 Leviticus 19:18.
b. Galatians 5:22 or, faithfulness.